Q: It is reported that Japanese Senior Vice Minister of Internal Affairs and Communications Jiro Akama visited Taiwan on 25 March to attend an event promoting Japan's culture held by the Japan-Taiwan Exchange Association. Reports say that Asaka was the highest-level Japanese government official to visit Taiwan since 1972. What is your comment? Will the visit bring a negative impact on China-Japan relations? A: The Taiwan question is a major matter of principle concerning the political foundation of China-Japan relations. China's position on the Taiwan question is consistent and clear. An incumbent senior vice minister visiting Taiwan obviously breaches the commitment made by Japan to interacting with Taiwan only at non-governmental and local levels and seriously counters the spirit of the four political documents between China and Japan. China is firmly opposed to the visit and has lodged serious representations with Japan. Since earlier this year, Japan has repeatedly taken provocative actions with regard to the Taiwan question while it has verbally promised to honor its commitment. This has already caused grave disturbances to the improvement of China-Japan relations. Let me reemphasize that the Taiwan question concerns China's core interests and brooks no challenge in the slightest. Japan should be aware of the consequences, stop its duplicity approach to Taiwan-related issues and not go further down the wrong path. Q: It is reported that some US congressmen initiated a bipartisan draft resolution on 23 March to condemn China's retaliation for THAAD. The resolution pointed out that China's retaliatory measures might violate WTO rules. What is your comment? A: I have seen the reports. You said certain congressmen, through the so-called resolution, "condemn" China. This word is what we dislike very much. I don't know how much these congressmen understand about the nuclear issue on the Korean Peninsula and the THAAD issue. But I do know that the so-called resolution is not constructive at all for resolving the issue. I want to reiterate that China's position on the nuclear issue on the Korean Peninsula and the THAAD issue is clear and consistent. There are not so-called retaliatory measures. 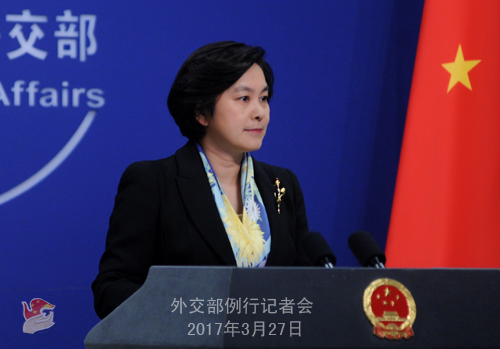 China regrets that the public foundation for exchanges and cooperation between China and the ROK is affected by THAAD. It is hoped that relevant parties face up to China's interests and concerns, truly give heed to the voices of the public and make a right choice. Q: The Australian government has been in contact with the Chinese government about the case of a university professor with Australian permanent residency Feng Chongyi who allegedly has been stopped at the Guangzhou airport from flying back to Australia. Can you confirm? Is there any information you can provide about the case? Why was he stopped from flying abroad? A: I am not aware of the specifics. But I have noted the reports saying that Feng Chongyi is a Chinese citizen holding a Chinese passport. 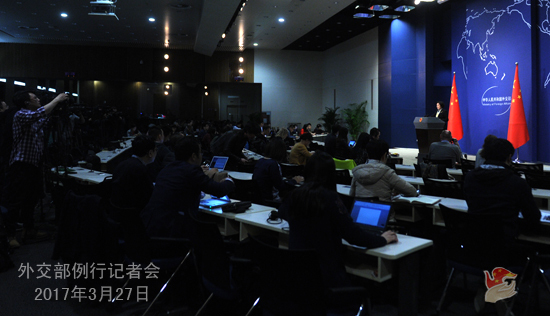 Q: According to media reports, Vice Foreign Minister Liu Zhenmin proposed in Boao to initiate and establish a cooperation framework among the coastal states of the South China Sea. Can you tell us more details and the considerations behind the idea? A: Realizing peace, stability, development and prosperity in the South China Sea meets the shared desire and responsibility of its coastal states and serves the common interests of these coastal states, among other members of the international community. Given that the South China Sea is a typical enclosed and semi-enclosed sea, its coastal states can draw upon the successful experience of other regions, and without prejudice to the parties' respective claims, work together to initiate and establish a relevant cooperation framework, which could serve as an effective platform for enhancing mutual trust, strengthening cooperation and promoting shared interests. China believes that the South China Sea coastal states can conduct practical and institutionalized cooperation in such fields as disaster prevention and reduction, maritime search and rescue, protection of marine environment and bio-diversity, marine scientific research and navigation safety. At the recent session on the South China Sea of the Boao Forum for Asia Annual Meeting, Vice Minister Liu Zhenmin elaborated on the cooperation framework that China proposed to initiate and establish. He said that now is the right time to launch cooperation among South China Sea coastal States. To quote a Chinese idiom, it is "of the right time, in the right place and with the support of the people." It is of the right time because the situation in the South China Sea has been cooling down. With countries returning to the right track of settling disputes through negotiation and consultation, much can be achieved in practical maritime cooperation. It is in the right place because there is solid international legal ground for setting up such a cooperation framework. According to the United Nations Convention of the Law of the Sea (UNCLOS), States bordering an enclosed or semi-enclosed sea should cooperate with each other in the exercise of their rights and in the performance of their duties under UNCLOS. They shall endeavor, directly or through an appropriate regional organization, to coordinate the utilization of the living resources of the sea, and protect and preserve the marine environment. Moreover, many international organizations, including specialized agencies of the United Nations, have encouraged the coastal States bordering an enclosed or semi-enclosed sea to establish mechanisms of cooperation. The coastal States of many closed or semi-closed seas like the South China Sea, such as the Caribbean Sea, the Mediterranean Sea, the Baltic Sea, the Black Sea and the Caspian Sea, have established cooperation mechanisms. These mechanisms broadened and enriched regional cooperation. They have been helpful in enhancing mutual trust among coastal States and mitigating territorial and jurisdictional disputes. Such a framework is supported by the people because people in our region enjoy a time-honored friendship and have forged close cultural bonds. As a vital part of the maritime Silk Road since ancient times, the South China Sea has borne witness to mutual help and common progress of all coastal States. China stands ready to further enhance communication and coordination with all parties on the relevant cooperation framework. We welcome ideas and suggestions from countries in this region. Q: Can you confirm that the Chinese government has decided to reopen the market of Brazilian meat imports? Why was the decision taken so fast after the ban was imposed? A: Relevant authorities of the Chinese and Brazilian governments have been in close communication and effective consultation in the wake of the quality issue of some Brazilian meat products. Brazil has recently notified China of its decision to suspend exports to China from the involved enterprises and promised to take stricter measures to ensure safe and reliable meat exports to China. With that, China has removed the preventive and temporary measures of protection and resumed normal inspection and quarantine efforts. China and Brazil are each other's important trading partners. China wants to work with Brazil to further push for sound development of bilateral trade and commerce on the basis of food safety protection. Q: According to media reports, the senior high school textbook recently approved by Japan's Education Ministry describes Diaoyu Dao as Japan's inherent territory. What is your comment? A: Diaoyu Dao and its affiliated islands are China's inherent territory. 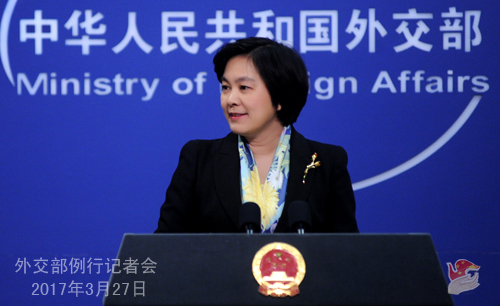 China's resolve to uphold its territorial sovereignty is unwavering. Whatever Japan says or does, the fact that Diaoyu Dao belongs to China cannot be changed. We urge Japan to respect history and reality, instill the right knowledge into the young generations, and stop stirring up troubles on the relevant issue.